FLEXTEND-TFT KIT is a tremendous addition to the basic FLEXTEND system for those suffering from Trigger Finger, Trigger Thumb, Blackberry Thumb, Tendonitis, DeQuervain's and other specific musculoskeletal disorders affecting the fingers or thumb. For those performing single-finger exercises with the basic FLEXTEND system, taking the band on and off to perform single-finger exercises can be time consuming. 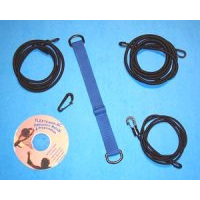 Now with the FLEXTEND-TFT KIT you can just click in and click out, and you no longer have to remove the main resistance bands to perform the recommended exercises. The FLEXTEND-TFT KIT is your key to fast, simple and effective therapy! 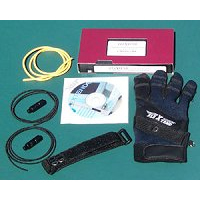 IMPORTANT: The FLEXTEND-TFT KIT only works with the FLEXTEND Orthotic Glove. It CANNOT be used by itself! 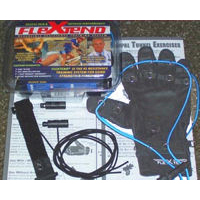 FLEXTEND-AC Kit attaches to the FLEXTEND glove, turning it into the FLEXTEND-AC Upper Extremity Training System. This training system performs more than 50 therapeutic exercises for injury prevention, rehabilitation and sports enhancement. 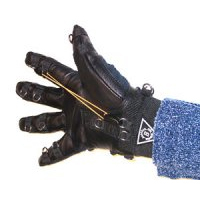 NOTE: YOU MUST HAVE A FLEXTEND GLOVE FOR THE AC-KIT TO WORK AS IT ATTACHES DIRECTLY TO THE FLEXTEND GLOVE! FLEXTEND®-AC Kit: One size fits all. FLEXTEND® is a patented, multifunctional exercise system that can help provide relief from the symptoms associated with many types of Repetitive Strain Injuries and musculoskeletal conditions by correcting the strength and length imbalance that exists between the strong, overused flexor muscles, and the weak, underdeveloped extensor muscles of the hand and forearm. To ensure you order the correct size, measure from the base of the hand (first wrist crease closest to palm) to the tip of the middle finger. Coldflex from Balance Systems Inc. is a self-cooling compression for prevention and treatment of injuries, swelling and reduction of core body temperature. For human and animal use, whenever cold therapy is recommended. It can be stored at room temperature or put in refrigerator (but must not be frozen).